The quality and high standard of Waterman speaks for itself. These luxury pens make ideal gifts for long-term employees or important business partners. We suggest engraving your Waterman pens to add a very special touch. Have a look through the allbranded online shop for your branded Waterman pens today! High quality promotional pens & pencils are for any business serious about their marketing efforts and serious about their customers. At the point of sale (POS), handing a grubby old ballpoint pen to the would be client can look unprofessional, ill prepared and lazy. That is exactly why you NEED a number of sophisticated and sleek pens (such as the Swiss printed Prodir pens) to hand to your clients. First impressions are important and you do not want the first contract your new client signs to be with a pen that does not represent your brands quality or values. The founding of Waterman can be traced back to 1883. According to a legend, at a contract-signing event, one of Lewis Edson Waterman’s fillable fountain pens was not working. As a result, the deal was not closed. Because of this mishap, Lewis Waterman founded the Ideal Pen Company, the companies name was changed 4 years later to ‘Waterman’. With this company, Waterman accomplished a breakthrough; He manufactured the first fountain pen with a regular ink flow and became the role model for the whole fountain pen industry. The integrated three ink channels have since been patented. But this was not the only invention of the company, in 1935 Waterman developed the first ink cartridge, which he also patented. Today Waterman is still at the forefront of innovation and design. Currently, Waterman is the second biggest fountain pen manufacturer worldwide. 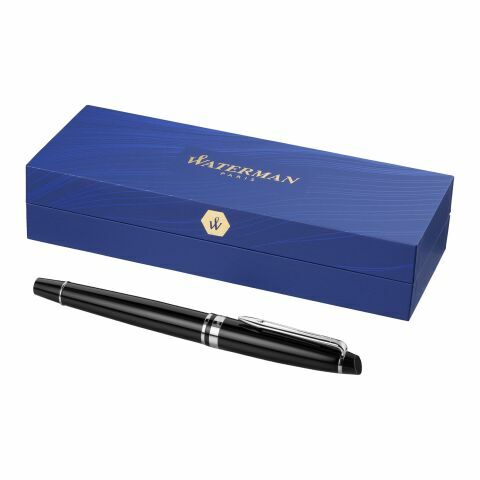 Since 1967, Waterman have been producing premium, high quality products, which are manufactured exclusively in the French Saint-Herblain in Nantes. These luxury pens have been awarded many times and generate a special impression on the target group. The high quality is noticeable upon first glance and shows generosity of spirit and appreciation towards the recipient. Waterman is an international sign for quality. The tradition of this company and the detailed design of their products, will convince your clients, co-workers and business partners at any special occasion. Sublime materials, clever lines and beautiful simplicity – these are all characteristics of the branded Waterman pens. All products are shaped by French elegancy and finesse. Every writing instrument is a sophisticated piece of art with a unique design. Waterman produce many variations of pen, some with extravagant varnish coatings - like the Waterman Exception, the Edson Version or the Graduate series, are available in a choice of colours. These pens also come with golden or silver highlights, floral and diamond shaped patterns. Waterman pens are more than useful tools, they are beautiful accessories, which can be the perfect brand ambassadors for your company. Writing instruments, like ballpoint pens, are one of the most popular promotional products in Britain. They are used regularly at the office or at home and, according to the ASI Impressions Study, generate 5615 brand experiences during the products life cycle. 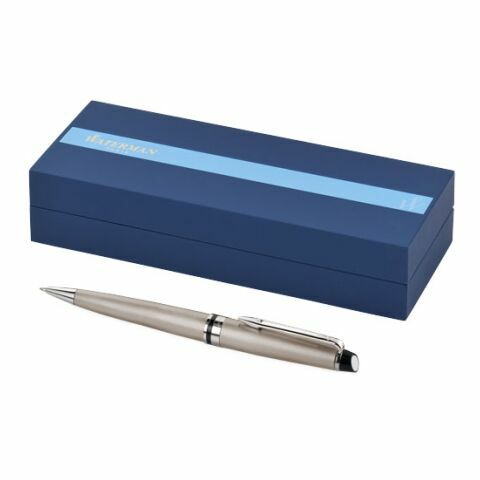 The gift of these luxurious pens will help to maintain good customer relationships. Our branded Waterman pens are not just any ballpoint pens. With their futuristic designs and their reputation for high quality, these promotional Waterman products can be more efficient as promotional pens than other standard products. By doing this, you will show your company stands for good taste and elegant craftsmanship. Even the younger, tech savvy generation appreciate a high quality printed pen. They might however appreciate a logo printed stylus pen even more! Personalised Waterman pens will give your advertising campaign a premium touch, give these branded pens to your customers, co-workers and business partners, every time they use that pen and see your branding, they will associate the elegant quality of Waterman with your business. Next to Waterman we offer other various brands at the allbranded online shop such as Rastal, Parker and BIC, allbranded is your reliable supplier for branded low cost giveaways as well as branded premium promotional gifts.